On the day of Sant Jordi in Barcelona – as in all of Catalonia – people give one another a rose or a book. Documents show that the tradition of giving away roses as a symbol of love on the day of Sant Jordi, dates back to the 15th century, even though the exact date is not known. Saint George was a hero – he saved a beautiful Princess who was about to come to a sticky end at the hands of a dragon who had been terrorising a village. 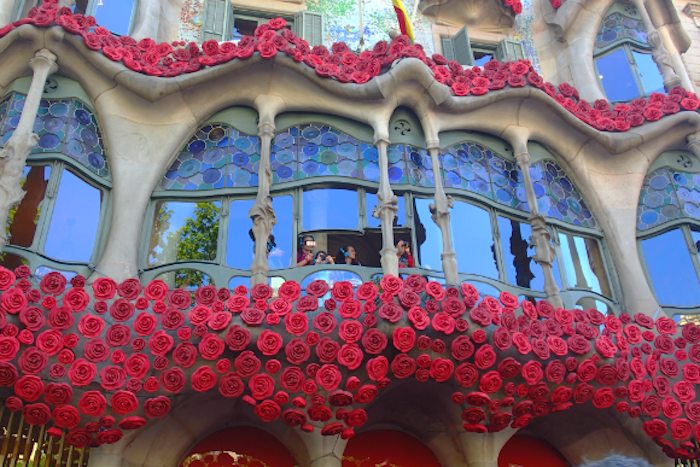 Sant Jordi is the Patron Saint of Catalunya and his tale is well-known throughout the city. In 1926 Spain declared the 23rd April, the anniversary of the death of Miguel de Cervantes, the most famous Spanish writer, as Book Day. It was a coincidence that this coincided with the day of the feast of Sant Jordi. This led, however, to mean that Book Day was hardly celebrated. Only much later did the day of love also became a day of literature in the mind of the population. 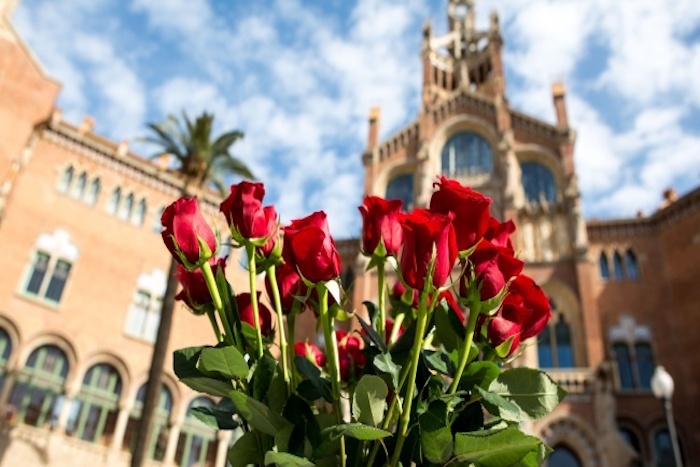 The 23rd April, the day of Sant Jordi, the patron saint of Catalonia, is today the day of the rose and the book, the day of love and culture. Each year, the streets are filled with people strolling around grasping books and roses wrapped in ribbons in the colours of the Catalan flag (The Senyera). 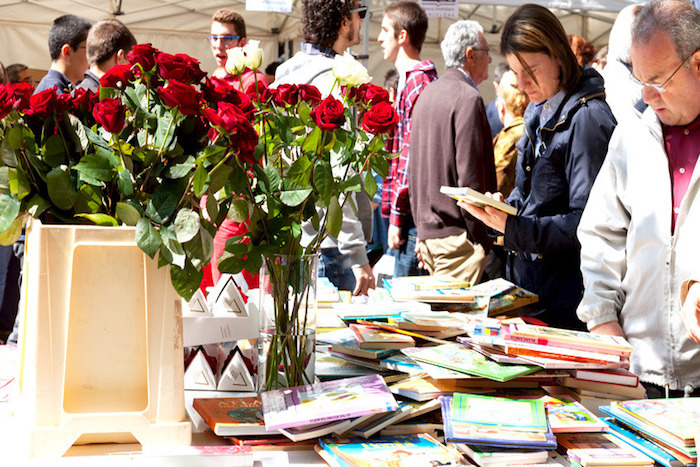 The streets and squares of Barcelona are filled with stalls selling books and roses. It is a picturesque sight in the Spring sunshine. 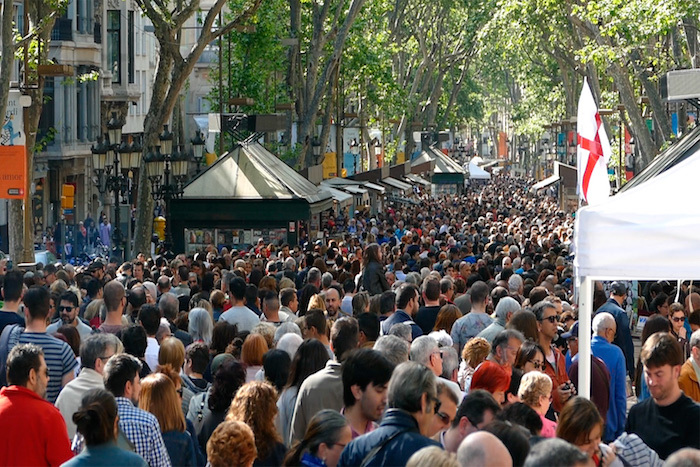 During Sant Jordi stalls crop up all over town. However, for the largest concentration of stalls it is best to head to the large square and streets: as shown below. La Rambla will be the centre of all the activity however it can become a little overcrowded during peak hours!